There is no way around it. You need a bike to do a triathlon. What you don’t need is a full carbon frame bike worth five grand if you can only manage 20k in about an hour. Nothing wrong with that sort of pace, before you start getting sniffy. It’s just that an old steel frame racer from yesteryear (the kind the cyclists used to do the Tour de France on) would do the trick. If like me you are a very average cyclist, then you had best get used to that ‘whup, whup’ slightly clunky but overall depressing sound of a solid wheel speedster flying by you on the bike leg. My meagre few races would suggest I average around 30km/h which is not going to set the world alight (nor my bike, for that matter). Last year, I dropped into an old school friend whose wife does triathlons. Whilst chatting, he mentioned he had an old racer in the shed. We ended up striking a deal and I took the bike off his hands for 100 Euro. Up to then, my only bike was a very nice Trek MTB; great bike, but rubbish for racing. 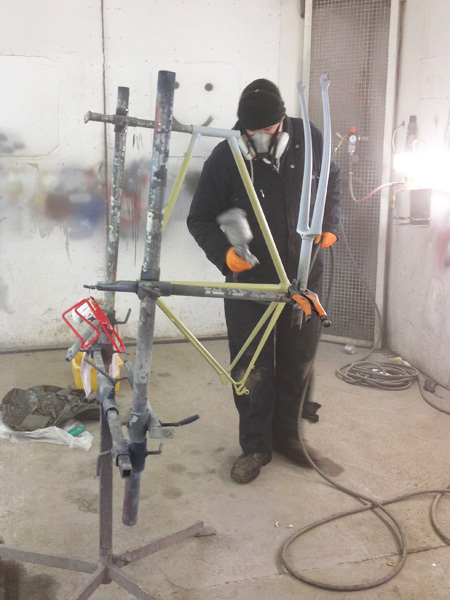 I stripped the racer down by hand myself, in my workshop/man-shed, and was initially quite dispirited to discover the ghastly silver topcoat hid a strange red, on top of another coat of white, and finally we hit gold. Literally. The original frame colour was gold. But better again, it turned out I had inadvertently purchased a Mercian. If you know your bikes (and I admit I don’t but I soon learned) then you will know these are all hand-made frames by a single, skilled frame-builder in their workshop in Derby, in England. More on them here. The wonderful Gothic script logo appeared, and alas, vanished, as I stripped and sanded the frame back to its original steel. It was made of Reynolds 531 tubing, and these stamps, along with the frame number under the crank, were all visible before I took it up to my mate Ian who owns a body-shop and garage, and he did a proper respray with acid etch, two-pack primer, several coats of red, and then the decals were put on (ordered from the internet), and then it was lacquered. Then followed the rather tricky process of reassembling the bike, and without my mate Terry all hope would have been lost. To say Terry knows his bikes would be to say the Iron Cowboy knows how to do triathlons. The bike slowly and magically came together, but not before Terry had warned me that every piece that came off the bike had to be scrubbed and cleaned meticulously. I could see the logic indeed; this is an excellent opportunity to get to know your bike, how it ticks, and more importantly, what condition the parts are in. After all, these are all the moving bits and bobs that will keep you upright when you are trundling down a hill at 50km/h. Worth taking the time to ensure they are fit for purpose. As it turned out, most of the gear was in good shape, but for the cycling buffs amongst you, the groupset (which is to say, the stuff you add on to a frame to make it into a bike after you have added the big stuff, such as the wheels, handlebars and saddle; so, the crankset, chain, cogs, gears, brakes, derailleurs, etc.) was not the original. Most likely, Mercian put Campagnolo on their early Mercians. 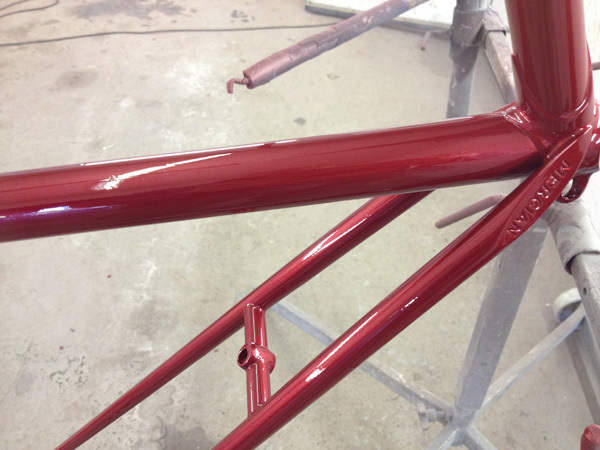 This frame would appear to be a 1982 King of Mercia. Designed as a touring bike, it was someone’s first pride and joy. When they traded up, they took the good Campag* stuff with them. What’s on it now is a Shimano 600 groupset, with Cinelli Criterium bars. These are nice and wide, which I like. And no, this does not have tri-bars fitted, nor will it. Not out of some form of inverse snobbery as such; it just wouldn’t work really. This is a classic 1980s racer. It has down-tube shifters. These I had to replace, but now I have fancy Campag** ones from the period. 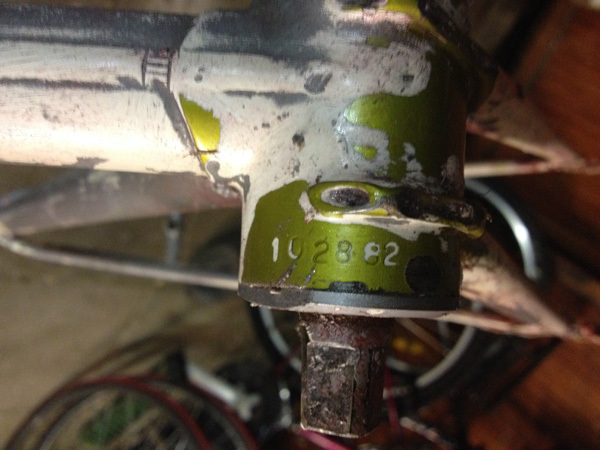 Down-tube gear shifting is a little like tape decks, Walkmans, or even – gasp! – vinyl. Give it to your kids and watch them scratch their heads. All bikes these days have gear shifters on the handlebars, and tri-bikes have tri-bars fitted and gear shifters on the end (in essence, time trial bikes). The Mercian will never have these gear shifters, or tri-bars. But she does have style. And she is also quite spritely for an old lady. She is also Nissan Micra Red, but I haven’t got the heart to tell her that, so I leave her to dream in the workshop that she is a Porsche. I bought some new Durano tyres recently, and am sticking with the 23mm. The tyre itself is durable and designed to go the distance, and be relatively good against punctures. The 23mm is just me pretending that I am actually going at speed. And to test that theory, I purchased (from yes, trusty Lidl) a bike computer for about a fiver. It works too, though on my first outing into the hills around Ardclough, the wire worked loose from the fork and got tangled up in the spokes and snapped in an instant. Solder and tape back at base made good the damage, and it has been fine since. It is reasonably accurate (they all mostly work on the basis of your wheel diameter). Coupled with the iPhone (I have SmartRunner installed), you can get a very good idea of what you’ve done as a workout. Once you have a few routes sussed out, you don’t need to be hauling all that stuff around. You just need a watch, or the computer. The pedals currently are the toe-strap variety. I quite like the intermediate stage between ordinary pedals and full clippies, which I have never used. So far, I have only managed to fall over once. Scarlet, as they say in Dublin. I would have loved to have seen it. No harm done, other than injured pride. I used my Mercian for the Sprint in Lough Key last year, and for the Olympic this year, in Athy. I managed about 30km/h on average. Perhaps one day we will have one of those fancy-pants carbon bikes with solid wheels and alien helmets. Unlikely. The last thing you want is to have all that gear and then have some fifty-year old geezer on an old classic steel-frame bike pass you out on the road! * You can’t really shorten Campagnolo to Campag unless you have been cycling for fifty years, and perhaps built a few bikes to boot. So I am taking huge liberties here, trying to pass myself off as a cyclist. For shame! ** I did it again!